Of the old estate of the Cantacuzino’s, all that remains is a tomb—and even that has been left to the elements—“The memorial has value, but the monument isn’t part of our database,” maintains the Director of Culture. Chris Bartholomew got in touch with me, all the way from Salt Lake City, to pass on his translation of an article he found in a Romanian newspaper about the family tomb of Balasha Cantacuzene, who was Paddy’s lover before the war. Thank you so much for your Patrick Leigh Fermor Blog. I have been a daily reader for about a year now, and have a difficult time thinking of life without my connection to this community you have brought together. Last night I came across three newspaper articles about Baleni, Romania where Paddy spent time with Balasa Cantacuzino (the romanian spelling of Cantacuzene). The newspaper is Viata Libera, I believe from the city of Galati. I’ve translated one article about the family tomb in Baleni, and thought it might be of interest to you and your readers as it provides excellent details about this mostly unpublished chapter of Paddy’s life. Generations of Cantacuzinos, the famous Byzantine noble family who contributed crowned heads to Romanian principalities, sleep forever in the locality of Baleni, almost forgotten. Of the manor house and their vast estate in the former Covurlui County, all that remains is a tomb, left crumbling and surrounded by decrepitude. Stories of princes and princesses always have happy endings. This only happens in fairy tales. In reality, the princesses buried at Baleni are crying and sobbing, and Leon [Balasa & Elena’s father], the final Cantacuzino male descendant from the south of Moldova, is turning in his grave. Artifact hunters have even broken into the tomb through the roof. But not even recent historical times have been among the most favorable. The last inhabitants of the manor, the daughters of Leon, Balasa and Elena, as well as Constantin Donici, the husband of the latter, were deported by the Communists to Pucioasa. Of the descendants of the Cantacuzinos of Baleni, it seems that no one is left alive. One night in March of 1949, the fate of the owners and of the estate was sealed. The solid and imposing manor was doomed to dust. An existing remnant of a reddish wall vaguely reminds us of the one time benefactors of the local communities, of country celebrations filled with good friends, and the many hunting expeditions. This is where in 1927 Nicolae Iorga, after a conference in Galati, came to admire the “splendid library, with artistic and rare editions.” This is also where Prince Sutu once dropped in, in his personal airplane. The precious library from Baleni, consisting of books in English, French, Russian, Greek, German and Romanian, was scattered in all directions, beginning on the night of its masters’ eviction. Some volumes came to an end burning in the bottom of a decommissioned root cellar, others were thrown into a nearby river. As not to muddy themselves during the early months of spring, activists used the books, gathered by the Cantacuzinos from the ends of the earth, to pave their walkways. Peasants fashioned shoes out of the luxurious covers of the books. Only a few hundred have found their way to the ‘V.A. Urechia” library, deposited by the Party or from other donations. Constructed, most likely, at the beginning of the 20th Century, the tomb situated in the old village cemetery, is “crammed” between graves whose ordinary souls also ask for the right to rest in peace. The funerary monument includes a chapel, constructed above the tomb. The crypt is open to anyone who would like to light a candle above the heads of these ten souls. The first of the resting places belongs to the brother of Leon. Next are buried the paternal grandmother and the parents of Leon. His father, Prince George Matei, died in Egypt, but was brought to Baleni, where he was given a very ceremonious funeral. Ana Vacarescu [Balasa’s mother] faded from life in 1923, followed that same year by her husband, Leon Cantacuzino. Balasa died in 1976, in Pucioasa. Elena brought her to Baleni and a few years later, also had the privilege of placing the incinerated remains of her dead husband in the crypt. In her turn, Elena was placed, in 1983, in her final resting place, by her former students. The final person buried in the Cantacuzino tomb is Georghe Farcas, a descendant of the noble estate. As the founders of the new village church, the Cantacuzino descendants are often mentioned, but only during religious services. The county cultural representative, councilman Marius Mitrof, told us that, concerning the value of the funeral monument, all circumstances point to the memorial receiving historical designation. A precedent exists, in the tomb of the Serfioti Family, from Filesti, and of the Crissovelon family, from Ghidigeni, found on the list of historical monuments. However, specialists still must take into account other parameters, such as its architectural value and the conditions of the construction. 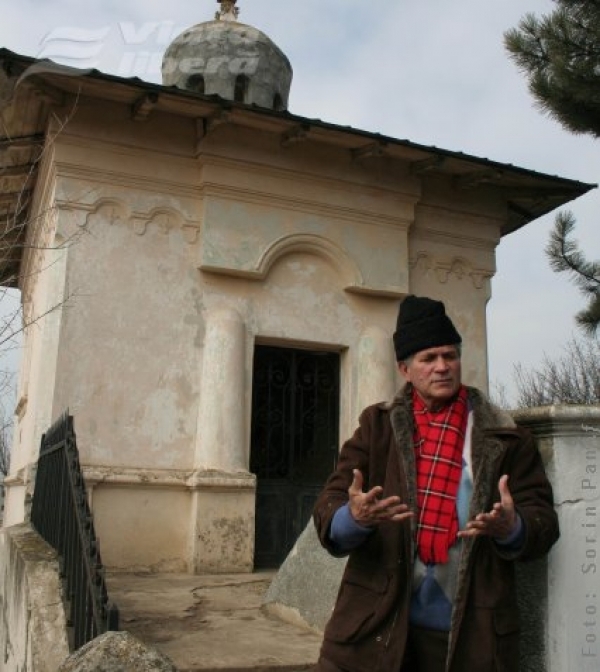 The former mayor, professor Nicolae Nita, admits, not without regret, that the princes, who might bring recognition to the village, are unjustly forgotten. Not even the current mayor, Lica Oprea, knows how this civic treasure might be given recognition without financial help from the county counsel. A first step would be, as Marius told us, to solicit historical designation for the tomb, from the Directorate of Culture. “We do not have this funeral monument in our database, but it follows for us to visit the site to collect information and to hold public discussion with the local administration,” he also said. On the other hand, even with an official place in the register of historical monuments, the tomb in Baleni has no guarantee that it will remain intact. Neither is it assured that, if the manor, once visited by Nicolae Iorga, had survived the Communists, it would have been maintained and promoted any better by our contemporaries. Here as well, sadly, we have precedents. Proof that our mentality must also be changed. This entry was posted in Paddy's Friends, Romania and tagged Balasha Cantacuzene, Between the Woods and the Water, Romania on November 18, 2011 by proverbs6to10. My grandparents lived in Baleni around the time Paddy lived there, they were friends with Balasa and her sister and they remembered Paddy as well. Unfortunately, they died without being able to read any of his books. However, Balasa’s sarcophagus is deposited in Bucharest https://en.wikipedia.org/wiki/Cantacuzino_family. Also they were not Romanians but Greek appointees of the Ottoman sultans at the thrones of the then 2Romanian Principates, a sistem that was overthrown after the national revolt in 1821. At that moment, all these appointed families were chased out of the country by the locals, however few exceptions existed. Maybe, hence the Romanian officials’ reluctance to finance keeping alive the memory of such an oppresive chapter of the Romanian history by foreigners? In fact, Paddy met Balasha in Greece, not in Romania, they went to live in Baleni for couple of years only because her family had a small property there and it’s a peaceful place with beautiful people. Highly recommended for a visit. Hello Simone. Yes the Cantacuzenes were Voivodes governing on behalf of the Sultan. In fact Paddy and Balasha first met at a party in the British Embassy in Bucharest in May 1935 (see An Adventure p104). They subsequently lived together in Greece before moving to Romania which Paddy left in September 1939. Philippa, the tomb is exactly at 45^48’32.45″ N – 27^50’53.02″ o Google Earth. Watch the formatting – cut and paste this: 45°48’32.45″ N, 27°50’53.02″E . That is his beauty nailed. PLF’s description of his last meeting with Balasha is indeed sad, in as much as the perils of WW II and the even worse depredations of communism resulted in the sisters living a life of penury. This all made worse for the fascinated reader since we somehow feel we know of them and, due to PLF’s uncritical views of all he met on his travels, have learnt to care for them, if only by proxy. I know Chris Lawson has great fondness for Romania; I don’t, as I found it a mixture of brutality and repressed artistic love, with the brutality having the upper hand. But then history is littered with the massacres of gentry by conquerors determined to impose themselves on dominated peoples. From Alexander and Attila through to Ceausescu. Doesn’t make it better though, does it? George – I disagree with Chris about many things, but I think we do both love Romania. As countries go my admiration is unqualified. Things are getting better there. Mark – Paddy did get leave to enter Romania in the 70’s I believe and he did meet Balasha once again. It is described in In Tearing Haste. Thanks Tom. I have not got around to reading In Tearing Haste yet. It is on my Christmas list! I encourage everyone to send one of Paddy’s books to a friend/family this Christmas. Spread the word! Yes, Janey, unfortunately only foreigners are sad about the situation, Romanians dont care too much. What foreigners also dont know is the huge distructive manner of Communism. Let the communism spread and let us be sad in the quiet. We do the world a favour. I feel sick, deeply sick and mortally depressed! I feel sad to hear this. I was always wondering about Balasha.